Whoever made this series decided that they weren't just going to make a cheap tie-in series, but rather make the best possible show they could. Featuring incredibly choreographed hand-animated fight scenes, one of Yuki Hayashi's best soundtracks (and that's saying something; it may even be better than his work on My Hero Academia), and a lovable, well-written cast, GBF just was not what I expected at all. Even the plot was excellent, making some wise decisions that avoid a lot of pitfalls common to the tie-in genre. There's no saving-the-world-with-a-children's-game shtick here, just a celebration of shonen values and the Gundam franchise. Even if you're not familiar with Gundam in general, you can still appreciate all the love and care that went into this franchise. 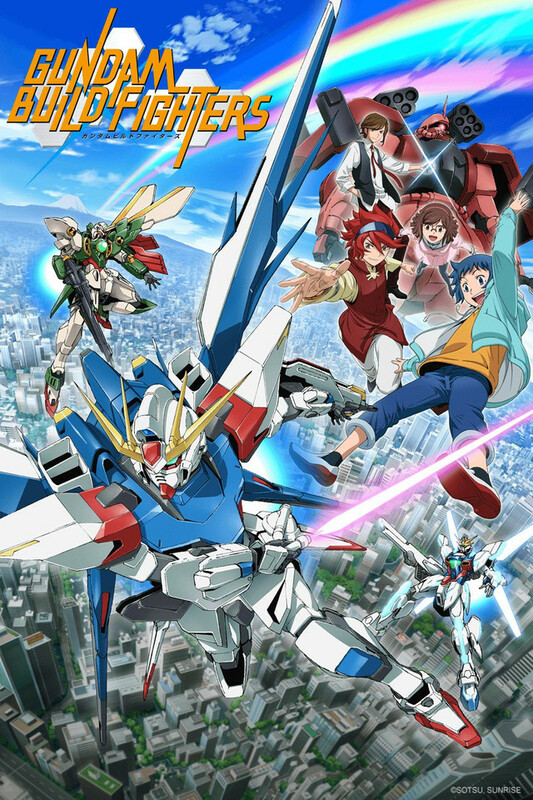 Oh, and there's a second season, Gundam Build Fighters Try. It's... well-animated? It's basically G Fighter Gundam but with a higher budget and less memorable characters. It's a flashy, cheesy, powering-up frenzy that's fun but lacks the great writing, delightful cast, and genuine heart that the first season had. So you know, go into it with those expectations, be prepared to yell at it for not including season one characters enough, and just have some mindless, feels-less fun. If you're familiar with "Angelic Layer." This is that show. Instead of dolls, there's Gundam Models. I've been a long time "Gundam" fan since Toonami's introduction of Gundam Wing. Like a fine wine, I've spent a good deal of my life watching all the series of Gundam. Some are more Science-Fiction, like the Seed series. While others are more realistic like the 08th MS Team. This series is none of those. This series was definitely created with modeling in mind. But often times, when you build a gundam model, you build it with dreams and you let your mind wander about piloting the model in actual combat. Why is this such a nice direction? Because you get to see suits of all series fight one of each other. Heavy Arms vs Qubeley is just one example. These are also modified with different paint schemes, modified parts, and new weapons. Watching this series really made me wish there was a way to build my own Gundam and battle them. There's not a lot of character development in this series. There's not a lot of gundam drama in this series. A lot of the adult themes that Gundam is known for is toned down. Keep in mind this is placed in an alternate 'real' earth, so "Gundam" is a science-fiction in this world. Blood, death and other tones of military life is kept at a cosplay level and creates a much brighter, vibrant world to visit. The story follows two kids that build and battle models. You follow them with each battle and they learn important life lessons along the way. Out of all the gundam series I've watched this is easily the capstone series for any fan. The more Gundam series you've watched, the more you'll enjoy the series. Graet series!! A must watch title!!! No spoilers here, just some inexplicable love for the series! I don't know why I liked this as much as I did, I loved it from the very start till the very end, I loved the music, the characters, the Gundams, the things it made me feel, everything about it, I can't explain not even to myself what is it about this that I liked so much, but I'm thankful to the people who did this for doing such a wonderful work, I haven't watched any Gundam series before, and now I want to watch them all and come back to this, and re-watch it, 'cause I know I'll enjoy it even more, even if now it seems impossible for me to like this more than I do, I know I will! after watching this series it just makes me wish even more that my gundams can do all of this!! UGHHHHHHHHH!!! MORE!! GIMME MORE!!! it kept me on the edge on my seat, and at times i couldnt help but scream for joy when one of my main favorite gundams is the protagonists gundam! i really hope they make more!! This show has it all! A way for new people to gain interest in Gundam while still giving nostalgia to die hard fans, with the bow on this beautiful present being the rush of emotions and excitement with each battle! The transition between season one and season two is rough, but you'll come to love every character and quirk this show throws your way! Most fun you can have with the Gundam franchise. The Gundam franchise as a whole takes itself very seriously, but this incarnation does just the opposite. It makes itself fun, really makes you wish we had their technology. I'm not going to write a big review, I'm just here to state for anyone that might think about watching it that it's definitely worth a shot. Another reviewed mentioned Angelic Layer, which is one of my favorite anime series, and this one is quite similar. Similar concepts, using models of customized mobile suits from throughout Gundam's grand history to fight on a souped up tech-table. I want to play Gunpla Battle, and I hate model kits. not so familiar with Gundam but this show was a good introduction. Love that it feel like one of the animes I've seen growing up like Pokémon and Yu-Gi-Oh. If your looking for some light hearted but action pack Gundamn this is your show. 10/10 would repeat.